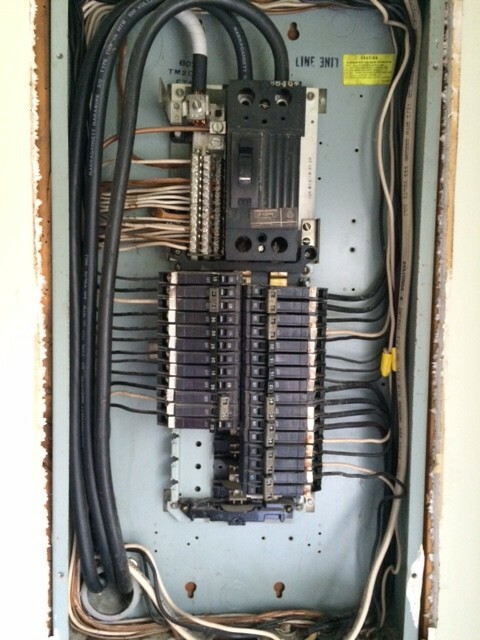 In my ongoing attempts to fix our heat pump, I decided to replace the circuit breaker in our panel. Both my husband and I had noted that the breaker grew quite warm while it was on, which was a little scary. It also became difficult to turn back on, as one side didn’t want to snap into place until you really forced it. Since a new thermostat and our attempts to fix the condenser unit had not fixed the “always running” issue, we figured it couldn’t hurt to replace the breaker. Disclaimer: I am not a contractor, electrician, or heating and cooling professional. The following information is based on internet sources and my own experience. If you are not comfortable with electrical repair, I recommend that you call a professional for repair. This is not a job for the faint-of-heart! 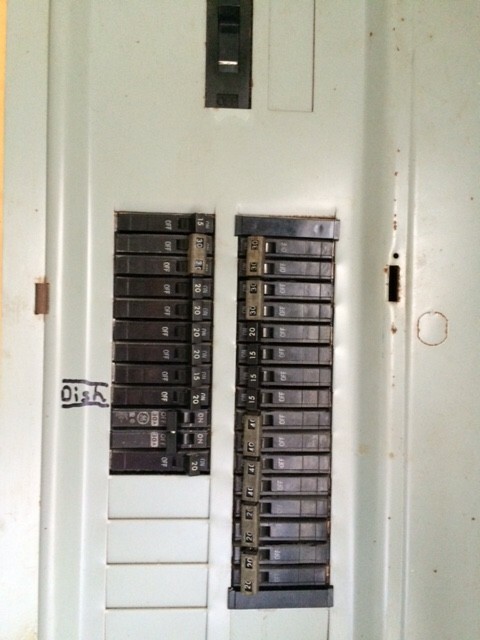 It is a double-pole 30-amp breaker. Our load center (breaker box) is manufactured by GE. I purchased a compatible replacement 30-amp double pole breaker with the same 1 inch footprint at Home Depot. The first thing that I did was gather my tools. 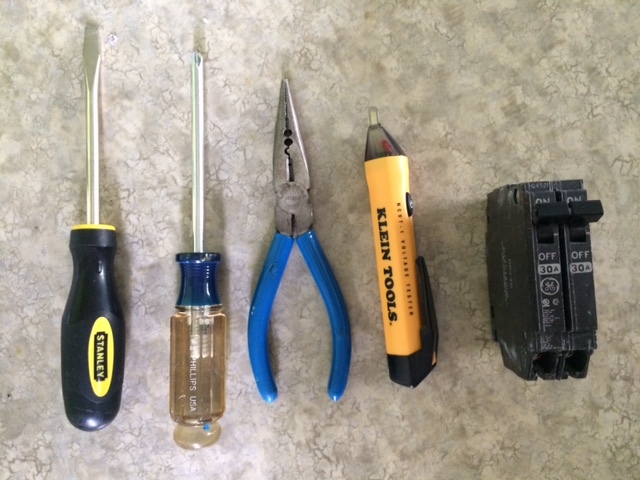 I got my needlenose pliers, a Phillips head screwdriver, a flathead screwdriver, my new non-contact voltage tester, and the new breaker. 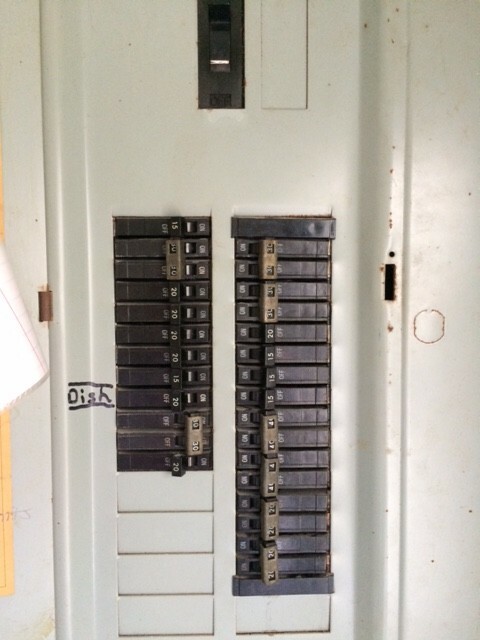 Next, I shut off all the circuit breakers, except the one that I was planning to replace. Then, I carefully removed the load center panel, which was held in place by four screws. It was very heavy. As you can see, the inside of a load center is pretty frickin’ scary looking. The reason that I left the main power on was so that I could test the breaker that I was replacing to see if there was power coming from it. To determine this, I said a short prayer, then touched my non-contact voltage tester to each of the screws on the breaker. As you can see, the red light came on, which means that there was power coming from the breaker. 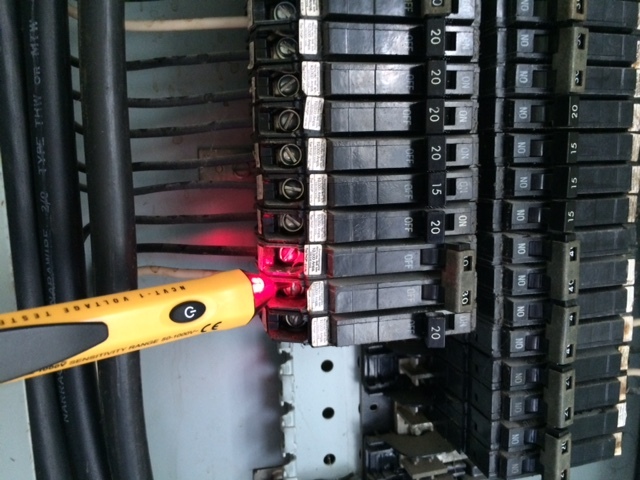 I turned the breaker off, being very careful not to touch anything else in the panel, then I tested the breaker again. 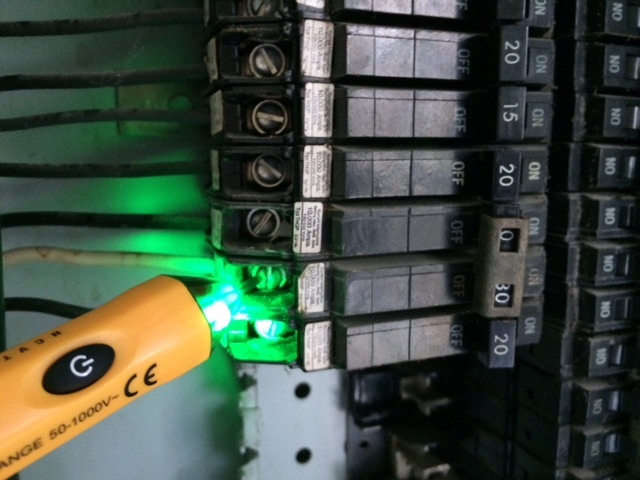 The green light showed, indicating that the breaker was off. At this point, I turned off the main breaker. It appeared that the breaker which I was replacing was operating properly. I decided to still replace it though, since it appeared to have an issue with snapping fully into the “on” position. I tested the breaker and the power bar inside the panel to make sure that they were both dead, then got to work. Then, I pulled up on the top of the breaker (the end closest to the “on” position) until the breaker snapped out of the panel. Then, I took the new breaker and loosened the wire screws on it. I inserted the black and white wires fully into the new breaker in the same position that they were in the old breaker, and tightened the screws securely. I gave a little tug on each to make sure that they were firmly in place. 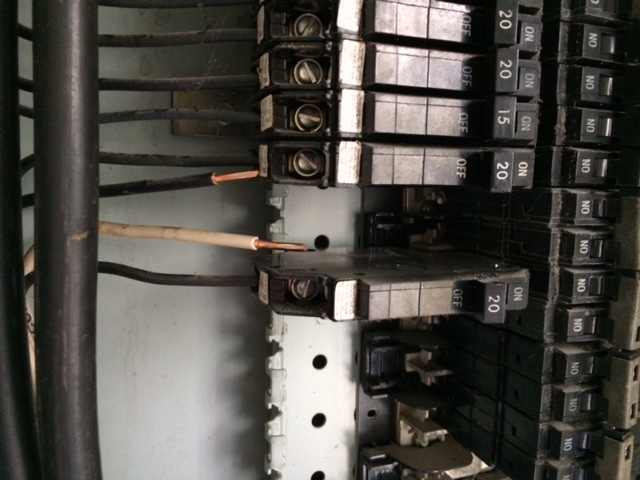 Then I hooked the bottom of the breaker into the panel, and snapped the top of the breaker in place. It didn’t really making as solid a “snap” as I would like, so I gave it a little extra push to be sure. 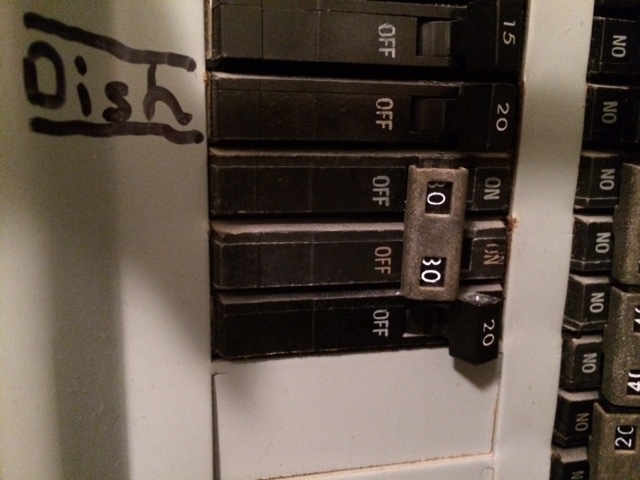 I turned the main breaker back on carefully, then turned the new breaker on carefully. It snapped on securely and firmly. I tested the screws on the breaker and got a red light indicating power. I shut the breaker off, then shut the main breaker off. Then, I replaced the cover of the panel, and screwed it securely into place. Everything looked good, so I turned the main breaker back on, then I turned each of the individual breakers on one at a time, ending with the new breaker. As soon as I turned the new breaker on, I heard the heat start running. However, the breakers outside next to the condensers were still off! I went outside but neither condenser was running. I went back inside and the heat was blowing full blast. WTF? At this point, I decided that I had done everything that I could do to fix the issue. The problem was obviously not with the thermostat (though I am glad we upgraded it), the condenser unit (though I am glad we replaced the sticky contactor), or with the circuit breaker. The problem must lie with the part of the system that is under our house: the air handler. There was no way that I wanted to crawl under there with the spiders, so I picked up the phone and called our HVAC service people. The very nice service man arrived first thing on Monday morning. We have a maintenance contract with the company, so first he tackled the maintenance on our units. 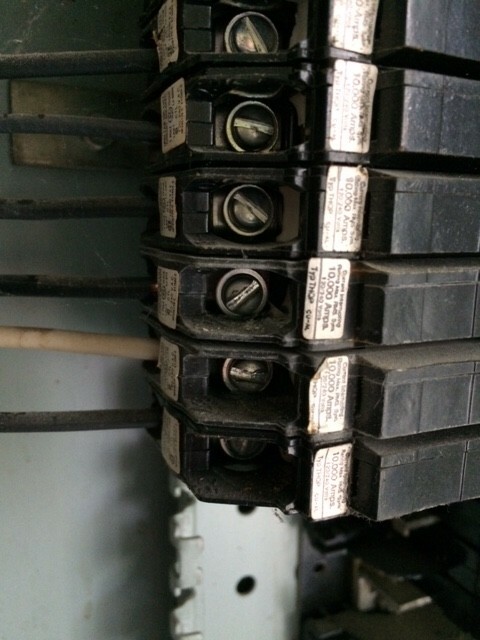 After crawling under the house to check the air handler, he reported that the circuit board and relay were melted, and that it would be $427 to fix it. 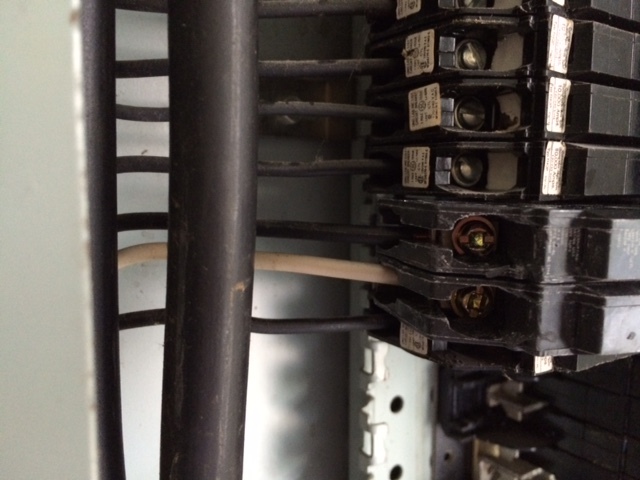 The melted relay was causing the auxiliary heat to run constantly as long as power was supplied to the unit. However, he intimated that a moderately-skilled DIYer, such as the type that could replace a thermostat (hint, hint), could handle the repairs easily. We made an appointment to have him return on Friday to make the repairs. Then, I did some online research to determine the cost of the parts themselves. I figured if the parts were upwards of $200, it would make sense to just pay our HVAC company to do the work. However, the two parts together were less than $70. I could save $350 by sucking it up and crawling under the house. I debated briefly, took a deep breath, then ordered the parts and cancelled the service appointment. The parts should arrive tomorrow. My husband agreed to go under the house with me, mostly as a show of moral support, since it is really a one person job. Stay tuned for all the subterranean excitement!